The term ‘Lest we forget’ is often used in reference to war and the loss of life. Here I use it to remember the refugees who have been forced to leave their homes in Iraq and Syria. 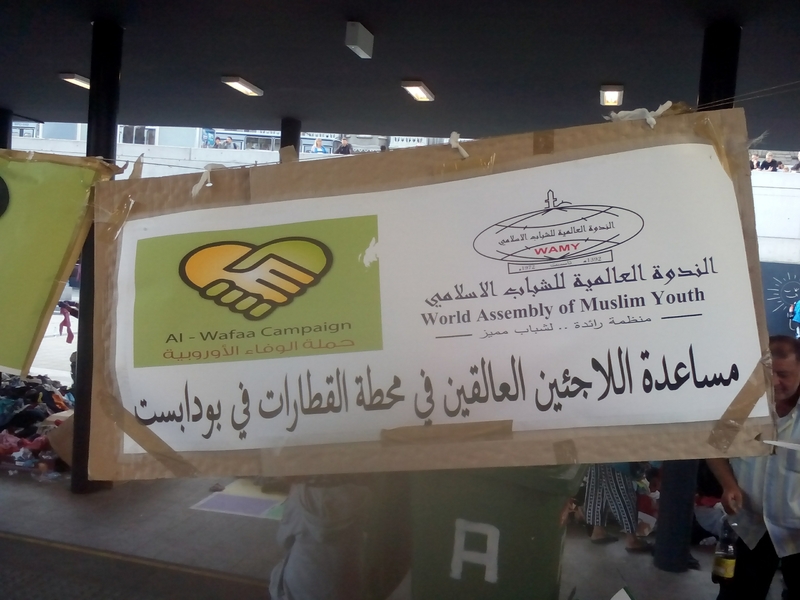 Last week I had the opportunity and privilege to meet a number of these people who are now living in Amman, Jordan. 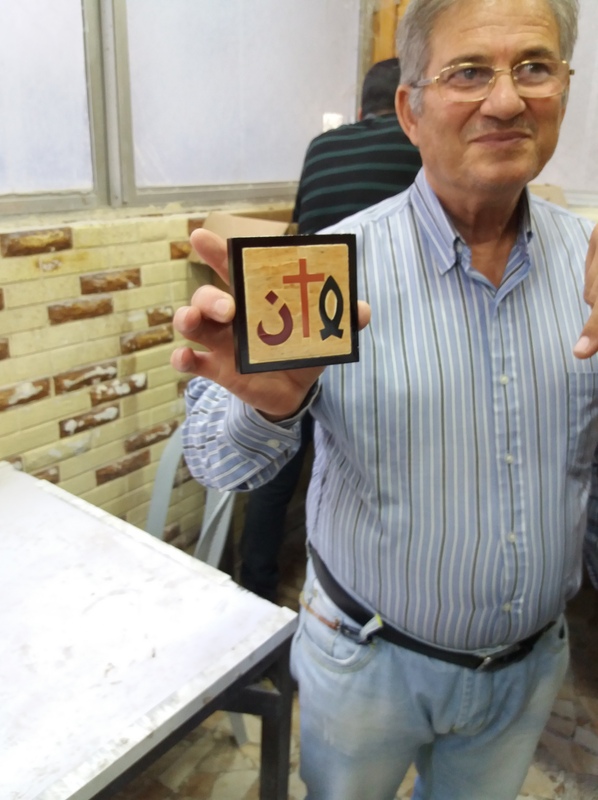 The evangelical Christian community in Amman are actively reaching out to these people and showing the love of Christ. One such church is the Marka Philadelphia Nazarene Church. 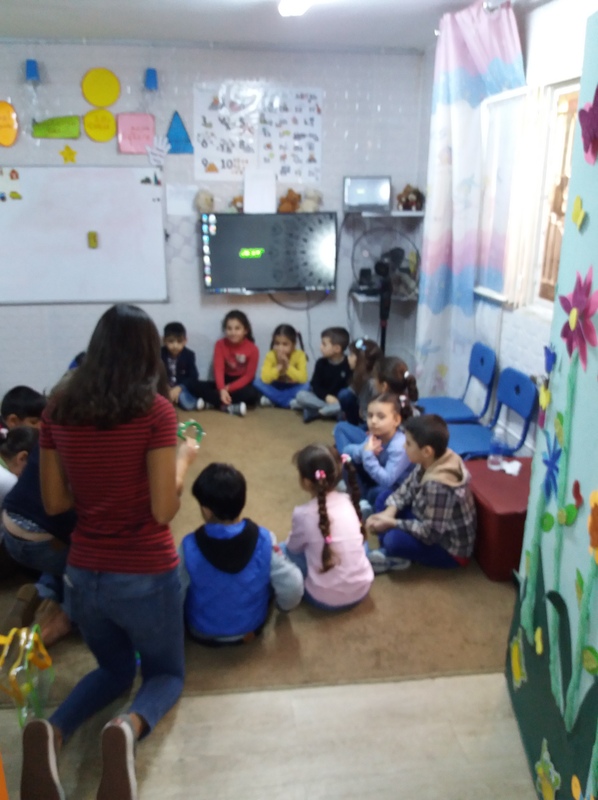 This church provides love, friendship, medical care, education and skills training to refugees and their families. Please see some photos. 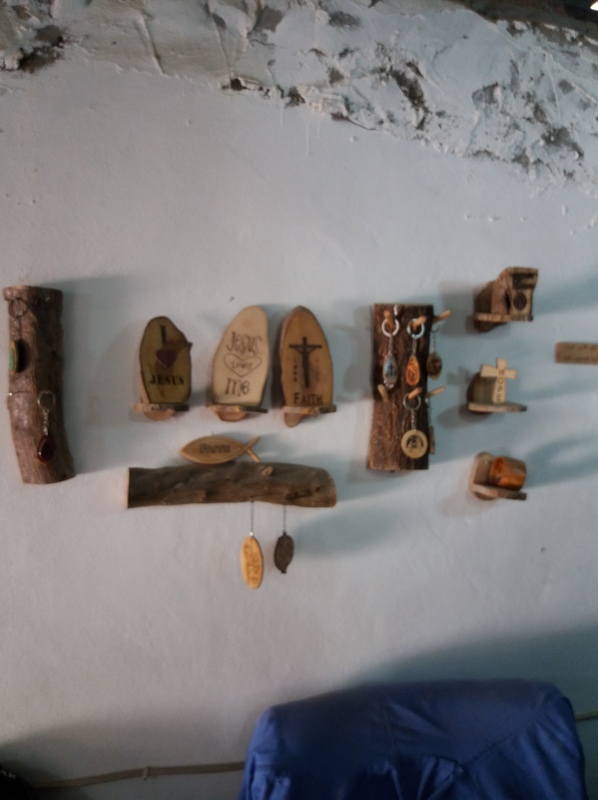 You will see some examples of beautiful woodwork the refugees have made (which are for sale along with other items such as soaps and jewellery). 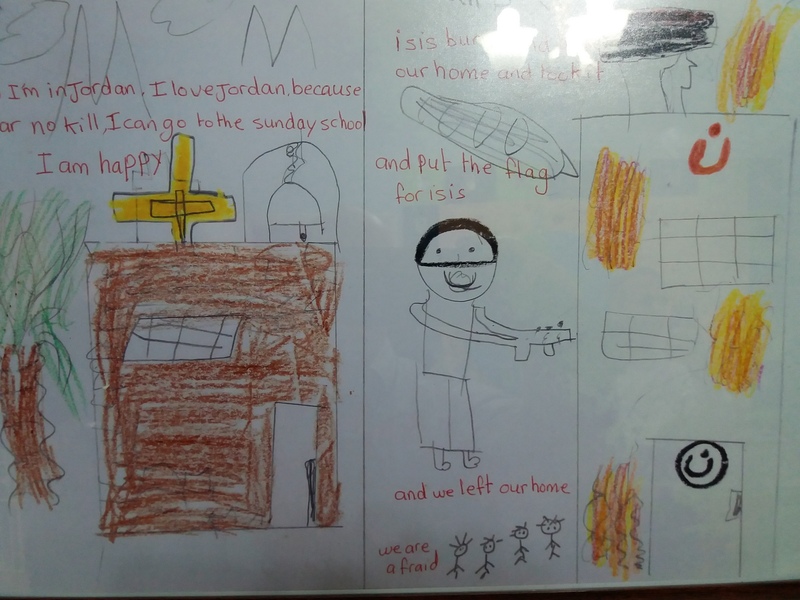 You will also see drawings that children have done, showing their lives under ISIS and now. I cannot express how amazing a job that this church is doing amongst the refugee community! Some Christians have been very unwilling to help/accept refugees (even though Christ was one as an infant). Well, now you have an opportunity to make a real difference! 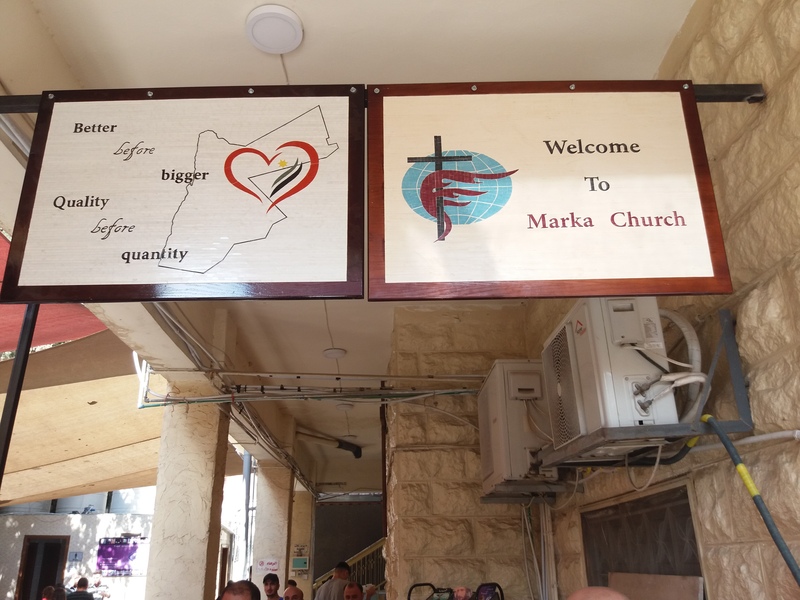 Shop from this church and support them and the refugees in a positive way. Also see the site http://www.asenseofcommunity.org to learn more about this ministry and how you can support it. For purchasing goods: http://www.shopwithamission.com and click on Jordan. 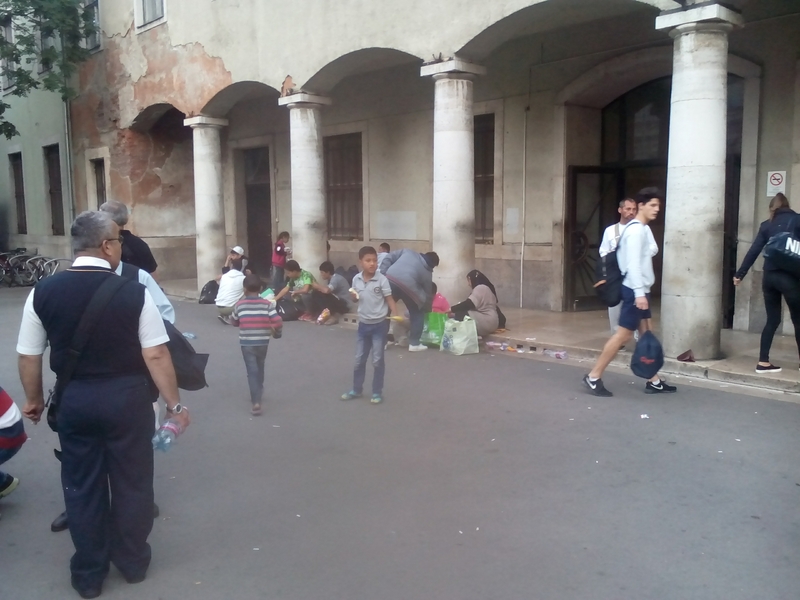 Today as I traveled to Budapest to preach at the Free Methodist Church, I was able to help a number of refugees. These men, women and children are trying to make their way to Austria but because they do not speak Hungarian they struggle to understand what train to take. 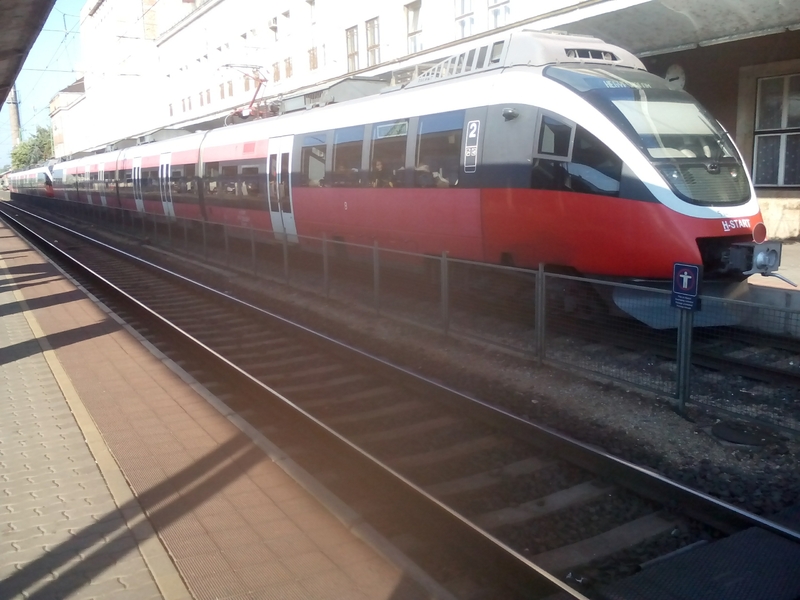 The picture above was a train entirely filled with refugees (mainly from Syria) making their way to the Hungarian/Austrian border town of Hegyeshalom. Today I assisted about100 people and made their journey a little easier. 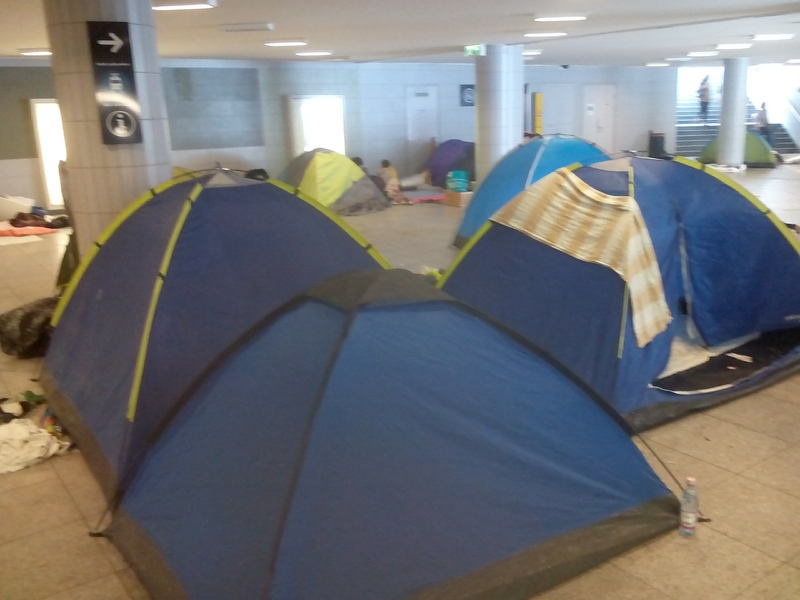 In Budapest and Gyor many refugees sleep in the train station. 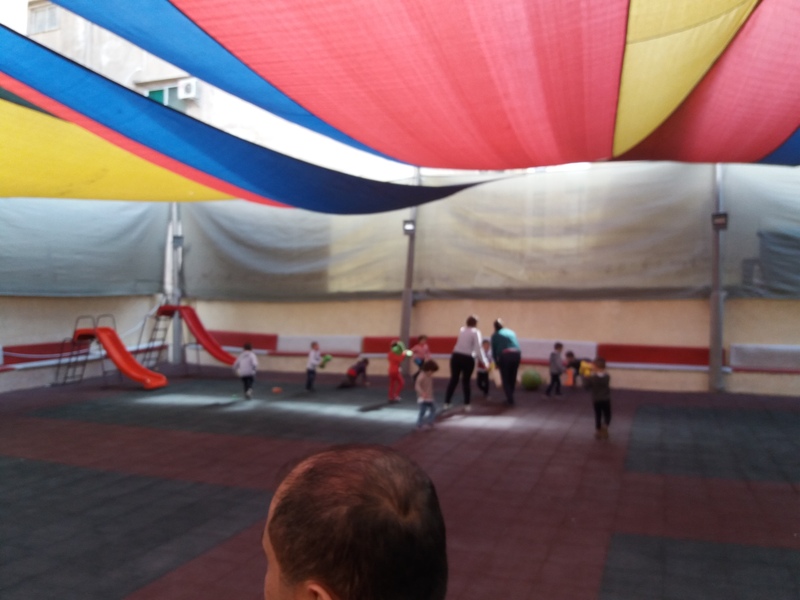 Thankfully the weather is still warm but with the colder weather approaching many refugees will suffer. Pray for us as we try to distribute clothing. 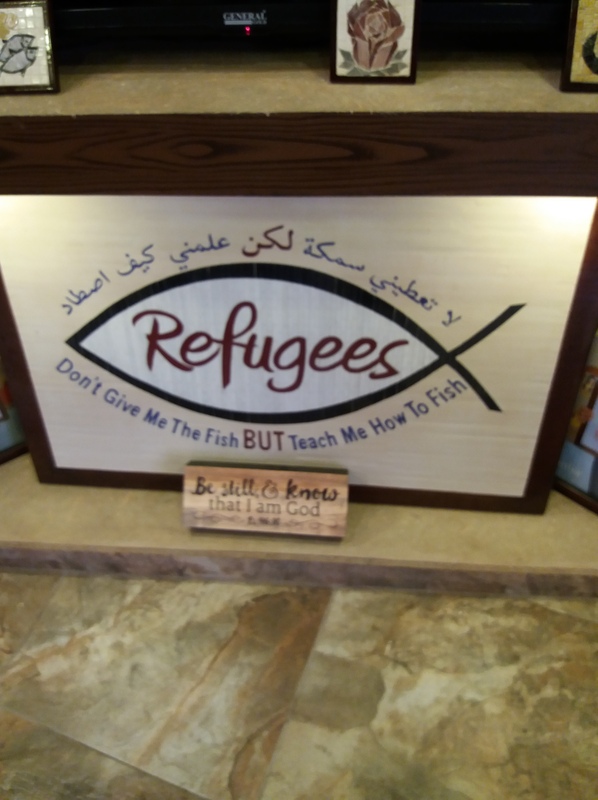 I’m still hopeful of getting into the nearby refugee centre to hold an English language Bible study/worship service. This past week I found out what I need to do for permission to enter. Please pray I would find favour and be allowed entry to serve God and these refugees. 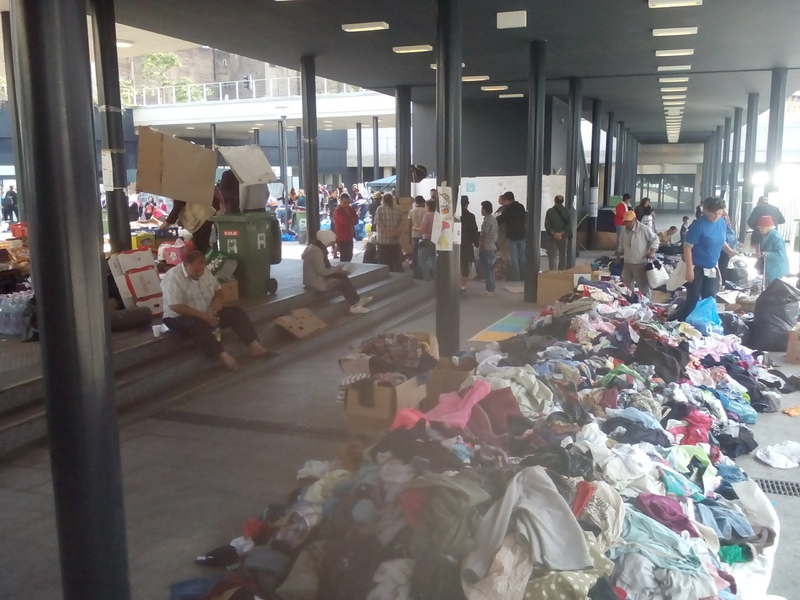 Free clothing at keleti train station, Budapest. To say we feel overwhelmed by the current refugee situation is an understatement. Daily between 2000-3000 people enter Hungary illegally from neighbouring Serbia. These people are fleeing war torn Afghanistan, Iraq and Syria. The Hungarian government has struggled to deal with this incredible influx of humanity. Many organisations are providing food, clothing and medical care. I (Gerry) am currently trying to get permission to enter one of the largest refugee centres to hold an English language Bible study/worship time. Many but not all of these refugees are Muslim. With my experience of working in the Middle East I hope to be able to reach many with the Gospel. Please pray that the doors would open wide before me.